After Forever 21 threatened to sue a fashion blogger for making fun of its clothes, the blogger, Rachel Kane, was initially cowed. Even though parody is generally protected speech, even though Forever 21's claims that readers might somehow mistake the joke site, WTForever21, for the corporate homepage were patently ludicrous, even though the very idea of Forever 21 prosecuting a copyright case instead of defending one raised eyebrows, the prospect of engaging in a long legal battle with a famously litigious and deep-pocketed company was not enticing. 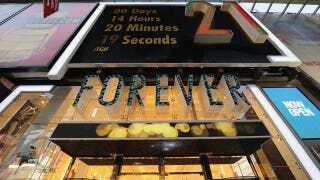 "Unless I can work something out with Forever 21, June 10 will be the last day for WTForever21.com," she wrote in an email earlier this week, adding, "I'm so disheartened by this." Well! Kane has changed her mind.